Razer Core external graphics enclosures are now compatible with Mac Thunderbolt™ 3 laptops unlocking desktop-class gaming and performance. 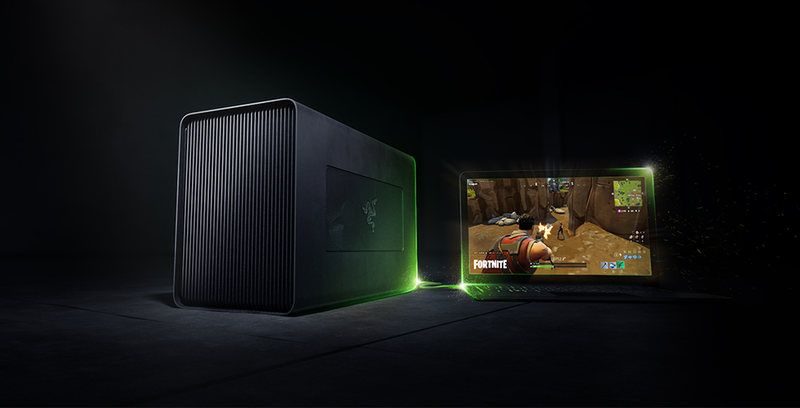 The new Core X transforms integrated graphics laptops like the Razer Blade Stealth into desktop-class gaming machines by adding an external graphics card. Gamers can also future-proof their gaming laptops or unlock VR-Ready experiences by boosting the performance beyond the current laptop’s limits. macOS- specifically Windows 10 Redstone 1 or later and macOS High Sierra 10.13.4 or later with compatible AMD Radeon™ cards. Razer compatible laptops include the Razer Blade Stealth, Razer Blade, and Razer Blade Pro (GTX 1060 version). Additional Windows 10 laptops require a Thunderbolt 3 port with external graphics (eGFX) support. Crafted from the ground up, the Razer Core X features an expanded internal design with a wider aluminum shell to accommodate up to 3-slot wide desktop graphics cards. The Core X supports the latest desktop PCIe graphics cards such as NVIDIA® GeForce®, NVIDIA® Quadro®, and AMD XConnect™ enabled Radeon™ and Radeon™ Pro cards. Harnessing the power of these high-performance graphics cards, the Core X accelerates creative workflow and creates a compact work- or battlestation. The Razer Core X embraces plug-and-play capabilities with the Thunderbolt™ 3 (USB-C) connection to the laptop. This eliminates the need for lengthy reboots every time the external graphics enclosure is connected. The convenient Thunderbolt™ 3 connection also yields fast speeds at up to 40Gbps. The Razer Core X houses a massive 650W ATX power supply to provide adequate power for the latest and future graphics cards. A single Thunderbolt™ 3 connection to the laptop now provides 100W of power for laptop charging. The aluminum enclosure is designed with open vents and additional desktop cooling to quickly dispense heat and provide optimal thermal performance whether for gaming sessions or digital currency mining. Physical installation of a desktop graphics card takes seconds with the Razer Core X. Its durable aluminum housing slides open with minimal effort and the graphics card is secured in place with a thumb screw for a tool less setup. Razer’s solution helps future-proof laptops, as graphics cards are easily swappable with new components and graphics as they become available. Razer also announced today the release of the new Razer Blade 15.6” gaming laptop featuring Intel’s latest 8th-generation six-core processor and NVIDIA™ Max-Q graphics. The Razer Core X is now available at $299 USD for order today in the United States, Canada, United Kingdom, France, Germany, China, and shipping soon to the Nordics, Australia, Hong Kong, Japan, Singapore, and Taiwan. The Razer Core V2 is currently available at $499 USD in the United States, Canada, United Kingdom, France, Germany, Nordics, China, Australia, Hong Kong, Japan, Singapore, and Taiwan.